Secrets of Salsa is a collection of 31 salsa recipes brought from Mexico to the beautiful area of Northern California known as Anderson Valley, a singular farming and ranching locale, isolated enough to have a distinct culture and even its own language! 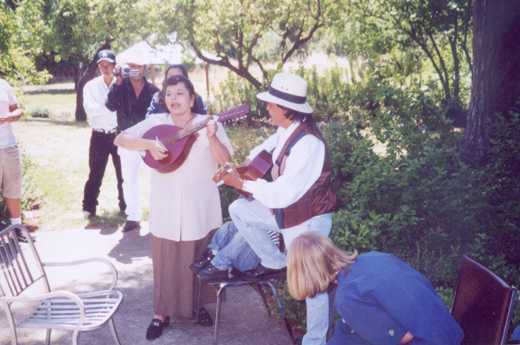 Over the past decades, Mexican immigrants have come to make up an essential and vibrant component of Anderson Valley’s unique, multi-faceted community. With varying levels of literacy in their native language and anxious expectations of what an English as a second language class might do for them, the women ventured out of their homes to attend class. By the time two local filmmakers, Heidi Knott and Lee Serrie, volunteered to create Sharing Secrets of Salsa: Mixing English with Community Spirit the women in the classes had not only written and contributed their special family recipe to the Secrets of Salsa cookbook, but participated in many a public event celebrating the cookbook and their accomplishments. The documentary DVD features the stories of the women and these authentic recipes, following the growth of the unique and ongoing project. Drawing strength from the appreciation of their family salsa recipes, the DVD became an opportunity to further expand their empowerment and horizons in their new language and culture. Like the cookbook, the production of the DVD by the professional filmmakers was carried out within the context of the classroom, local artists, and the salsa-tasting events. Sharing Secrets of Salsa: Mixing English with Community Spirit dramatizes the changing the lives of the women as well as the building of cultural bridges our community. The DVD is $10 + tax and shipping. All proceeds from this heartwarming documentary benefit adult literacy classes. Secrets of Salsa grew out of an adult school English conversation class, attended by women struggling with a strange culture and a difficult, unknown language. They gathered to learn English, of course, but also to find mutual support. They began sharing meals and recipes, and gradually, out of that beginning, came this book. As the project progressed, and as the first editions were published and found success, the women gained confidence and pride in skills they had never even realized were valuable. Over ten years later, Secrets of Salsa has sold over 27,000 copies worldwide, and the proceeds from these sales have gone to the continued support of the Anderson Valley Adult School, so that others, too, can gain the language and citizenship skills needed for successful, productive lives. So when you enjoy these wonderful salsa recipes, know that you are participating, as well, in a ongoing community success story. But, most importantly, of course, you have some truly wonderful salsa experiences ahead of you. ¡Bien provecho!